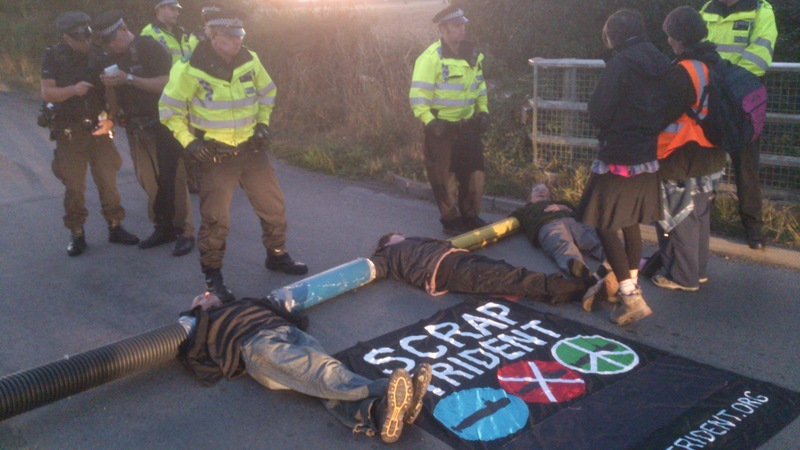 Early in the morning of September 2, activists from all over Europe blockaded the two gates of AWE Burghfield, where Britain’s nuclear warheads are assembled and maintained. For almost an hour, all vehicle access to AWE Burghfield was blocked, until police cleared a lock-on blockade of six Finnish activists on The Mearings to the south of the main gate. Later, a blockade of Scottish activists and another blockade of Belgian activists were cleared to the east of AWE Burghfield, near construction gate. Twenty-two activists were arrested by police. The blockade and actions were part of a two week peace camp organised by Trident Ploughshares and Action AWE, involving peace activists from all over Britain, and from France, Belgium, Spain, Netherlands, Finland, and Germany. Two CND vice presidents, Pat Arrowsmith and Rebecca Johnson, were among the protesters. CND also held a solidarity protest in London on Parliament Square in the morning, calling for the scrapping of Trident. What are they actually doing at Burghfield, the judge at Reading court asked me. Standing in a glass cell like a dangerous animal in an exhibition I answered his question: They are producing and doing the maintenance work on nuclear weapons there, and your government is planning to spend 100 billion pounds renewing the whole arsenal, can you imagine? In the middle of the night we left to get to our spot, a country road leading to the construction gate at AWE Burghfield. Thousands of stars were shining upon us and the sickle moon was shining in the deep dark night. After having done a last ‘ toilet’ visit we ran out of our hiding spot to sit down on the road with a whole lot of lock-ons and eventually handcuffs. Papa, the father of some of us, nicknamed papa by all of us, stopped the traffic and explained why we were blocking the road to all car drivers. As the sun came up our stiff limbs (being locked onto and in to a pipe does that) warmed up, preying birds started flying above our heads and the world seemed to be a nice peaceful and quiet place. It took the police quite some time to get to our blockade and when they did it took them ages to decide to arrest us. Guys with big tools came out to destroy our lock-ons and arrested all of us but papa, who was doing the legal observing. After having been processed being in a police cell on my own was a good opportunity to catch up on the lack of sleep the night before. Well, that is, officers coming to wake you up all through the night to check if you are ok, and drunk folks shouting and throwing around stuff in their cells didnt make it the perfect sleeping spot, but at least I did get some sleep. In the morning I was send to court in Reading. As I decided to represent myself and not have a sollicitor doing that, I had quite some opportunities to educate the judge on what is happening at AWE Burghfield and how the production of nuclear weapons is really a preparation for violating international law and thus a war crime. In the cell I was kept in for about twenty hours a message was stencilled saying one could report crime anonymously and get a cash reward for doing that. I heard people giggling in the court hall when I told the judge I would like to report a crime, not anonymously and not for the cash, but as a citizen wishing to uphold international law. In the end the judge found me guilty of violating the highway act but wouldn’t fine me if only I would not violate the law in the UK in the coming 12 months.